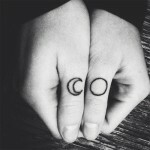 The tattoo on Génesis Rodríguez’s is a hamsa, a hand-shaped amulet which is though to protect against the evil eye. 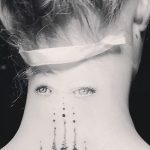 Hamsas are common throughout the Middle East but hers has Israeli imagery with a Star of David (Jewish star) and the hebrew word chai (חַי‎) which means “life.” Génesis is not Jewish but was inspired by a trip that she took to Israel to film a TV show. 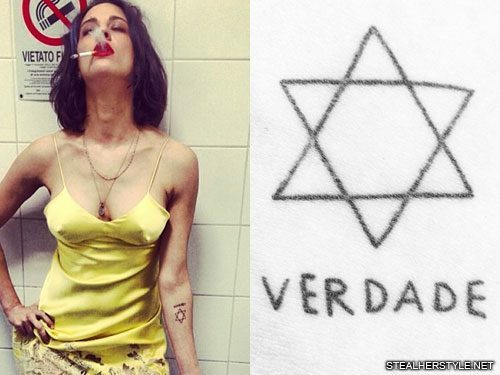 Katie Waissel, who is Jewish, has a tattoo on her right ankle of a Star of David or Jewish Star. The six-pointed star is widely used as a symbol of the Jewish religion.